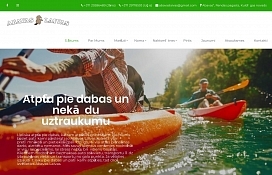 ABAVAS LAIVAS – Boat rental, boats, motor boat rental, organizing of events, water attractions, inflatable attractions, holiday house on the shore of Usma lake, sauna „Upeskalnos”. Bath-house attendant, Bath-house, Sauna on the shore of the lake, Boat rental. Motorboat rental, Recreation by the water. A holiday home on the shores of Lake Usmas. Boats, Boat rental, Motorboat rental, Boats, boat rental, boat trade. (new three-seat „VIKING”) canoe river boats. Kayak rental, (double) Boating. training. Recreational routes, routes to relax by the water, on the water. Campings, recreation places, fireplace sites, tent places, tent places. Crewsaver, Hiko, Eckla boating accessories. We work all over Latvia. cultivated places of rest. Guest accommodation of up to 50 persons. Kurzeme, Kuldiga, Sīmani. Abava, Boat trip in Abava. Accommodation next to Usma lake. Bath house „Abavas”, In Renda, On the bank of Abava river. Bathhouse complex.